It is perhaps the biggest leap in Bike on Transit intermodal integration since Caltrain took out seats to carry 24 bikes per commuter train in the mid 1990's. Roaring Fork Transit located in Aspen and Glenwood Springs Colorado has just launched their Bike Express. Each scheduled bus will carry 12 - 16 bikes. 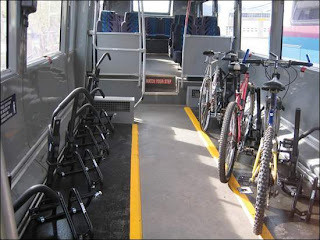 RFTA is one of the pioneer bike on bus transit agencies, installing custom made bike racks on buses in 1980 11 years before Valley Transit in Phoenix rolled out the fold up bike rack that now is on over 60 percent of the transit buses in the country. Demand is very high and these buses will supplement normal the 30 - 60 minute service along Highway 82 that carries 4 bikes per bus during daylight hours only. i'm curious if it would work to ride to the bus, lock up, ride the bus, then grab another bike when u got off?